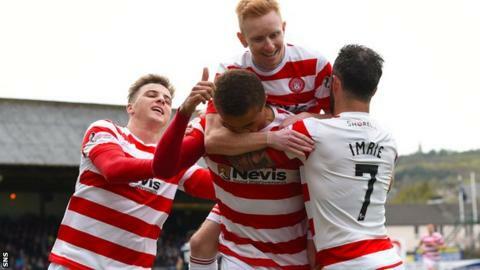 Hamilton Accies secured their Premiership status for next season with a narrow win courtesy of a solitary goal from Carlton Morris at Dens Park. That and Kilmarnock's defeat to Partick Thistle means it's the Ayrshire side who are confined to the play-off. Accies thought they had scored a second goal through Eamonn Brophy but it was disallowed for offside. However, it was Accies' third win in four matches and that form has come at the right time. It was a lack lustre start from the home side and that was evident when Morris opened the scoring. A ball that should have been dealt with by the Dundee midfield fell to Morris who took a neat touch before turning inside the box and sending a low left-foot shot into the corner of the net. Maybe Dundee's exertions in the derby earlier in the week had taken their toll but they gradually found their rhythm and should have been level before the mid-point of the first half after going close on three occasions. A terrific solo run by Craig Wighton saw him elude three Accies defenders before having his effort blocked. Kane Hemmings then headed a Paul McGinn cross over the bar before a neat sweeping move saw Nick Ross miss a sitter when he screwed his shot wide of the post from six yards. The visitors main threat came from set pieces and Jesus Garcia Tena should have done better than send a header from an Ali Crawford corner kick wide of the target. It became heated at times and referee Steven McLean had to brandish yellow cards to Accies Gramoz Kurtaj, for hauling Darren O'Dea to the ground, and Dougie Imrie for dissent. Hemmings then fired a 25-yard free kick which broke back off the Accies defensive wall. The rebound fell to Greg Stewart who blasted wide from the edge of the area. The most controversial moment came two minutes after the interval when Eamonn Brophy thought he had put Accies 2-0 ahead but instead saw his effort disallowed for offside. The main issue was the time it took for the officials to reach that decision, with the players having already lined up to restart the game despite protests from Dundee players for offside. A discussion then took place between ref McLean and his assistant Graham Chambers which lasted about two minutes before they disallowed the counter. Just as the news came through that Partick Thistle had gone two-nil up on Kilmarnock, Imrie almost increased Accies lead with a diving header from a Kurtaj cross. But Scott Bain reacted well to tip the goal bound effort over the bar. Holding onto the slim lead became defensively testing for the Lanarkshire club as Dundee pressed for an equaliser. Darryl Meggatt had a header from a Stewart corner blocked on the line before substitute Rory Loy saw his low shot smothered by Michael McGovern. Accies missed a couple of chances near the end to extend their margin of victory through substitutes Alex D'Acol and Greg Docherty, but one goal was sufficient to see them remain in the top flight for a third successive season. Match ends, Dundee 0, Hamilton Academical 1. Second Half ends, Dundee 0, Hamilton Academical 1. Attempt missed. Greg Docherty (Hamilton Academical) right footed shot from the centre of the box misses to the left. Attempt saved. Alejandro D'Acol (Hamilton Academical) right footed shot from the centre of the box is saved in the bottom right corner. Attempt missed. Kevin Holt (Dundee) left footed shot from the left side of the box is high and wide to the right. Ziggy Gordon (Hamilton Academical) is shown the yellow card for a bad foul. Paul McGinn (Dundee) wins a free kick in the attacking half. Greg Docherty (Hamilton Academical) is shown the yellow card for a bad foul. Daryll Meggatt (Dundee) wins a free kick in the attacking half. Michael Devlin (Hamilton Academical) wins a free kick in the attacking half. Corner, Dundee. Conceded by Michael Devlin. Attempt missed. Dougie Imrie (Hamilton Academical) left footed shot from outside the box misses to the left. Kostadin Gadzhalov (Dundee) is shown the yellow card for a bad foul. Gramoz Kurtaj (Hamilton Academical) wins a free kick in the defensive half. Substitution, Hamilton Academical. Grant Gillespie replaces Ali Crawford. Attempt saved. Kane Hemmings (Dundee) right footed shot from outside the box is saved in the top centre of the goal. Substitution, Hamilton Academical. Alejandro D'Acol replaces Carlton Morris because of an injury. Delay in match Carlton Morris (Hamilton Academical) because of an injury. Attempt saved. Rory Loy (Dundee) right footed shot from the centre of the box is saved in the bottom left corner. Corner, Dundee. Conceded by Gramoz Kurtaj. Corner, Dundee. Conceded by Carlton Morris. Substitution, Dundee. Rory Loy replaces Julen Etxabeguren Leanizbarrutia. Attempt missed. Ali Crawford (Hamilton Academical) left footed shot from outside the box misses to the left. Attempt missed. Jesus Garcia Tena (Hamilton Academical) left footed shot from the right side of the box is close, but misses to the left. Corner, Hamilton Academical. Conceded by Scott Bain. Attempt saved. Dougie Imrie (Hamilton Academical) header from very close range is saved in the centre of the goal.